Does your sporting club feel strongly about family violence? Domestic violence action plans help sporting clubs organise and plan their approach to reducing family violence. 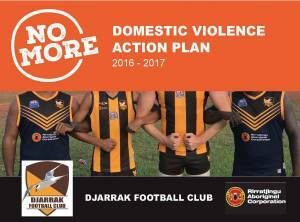 The NO MORE Campaign has developed the concept of family violence action plans as a way of formalizing a club’s intentions, as well as providing a basic document that can be distributed to members and the public. The plan outlines basic goals, commitments, strategies, responsibilities and time frames for the club. Each plan is unique to the individual goals and actions of each club. Please feel free to use our template below to get started, or alternatively contact us for help. Check out some of the sporting clubs DVAPs below. 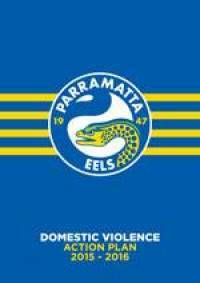 Parramatta Eels were the first national sporting club to write a DVAP and continue to show that they take a strong stand against family violence. Djarrak Football Club, based in Yirrkala, was the first club in the Gove AFL to develop a DVAP. 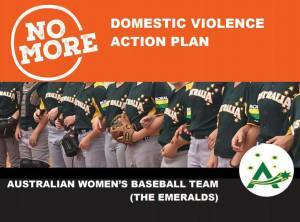 The Australian women's baseball team The Emeralds are one of the first baseball teams in Australia to write a DVAP.